This blog has been quiet, but I've actually been stitching quite a bit this year. 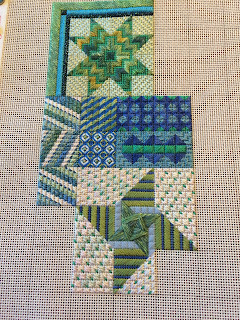 Here's my progress on Starstruck, a charted needlepoint design by Kathy Rees of Needle Delights, done in the blue/green colorway. The duClay EGA chapter in Jacksonville, Florida is hosting a stitch-along for any Kathy Rees design, and I'm delighted to stitch with them.